During the early 80s R.E. ran several issues on building a robot called the Unicorn One. One of the issues gave drawings on building the arms, which were very detailed. I have been looking for this issue without any luck. If any one knows the or has an issue please let me know. If you are still looking for the RE issues with the arm details I have them. I will have to scan them. The 2 part series was in the August and September issues of RE. Eman wrote: If you are still looking for the RE issues with the arm details I have them. I will have to scan them. The 2 part series was in the August and September issues of RE. I have scanned the pages, just need an email addy to send them to or if you wish I can snail mail to your address. Just sent them your way. If you need anything else drop me a line. Glad I could help. I've got almost all of the radio electronics Unicorn-1 articles scanned and put into a .pdf if you still want them. tymtravlr wrote: During the early 80s R.E. ran several issues on building a robot called the Unicorn One. One of the issues gave drawings on building the arms, which were very detailed. I have been looking for this issue without any luck. If any one knows the or has an issue please let me know. There are a few more articles I need to scan to complete the series. Wow, thanks Karl. I always wanted to read these. I remember seeing that Radio-Electronics published all of these in a book but I was 13 at the time and didn't have a way to order it. 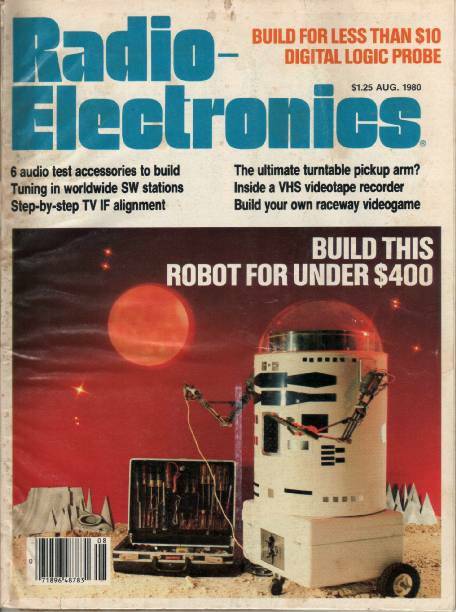 BTW, Karl, Are you the author of the BERT robot that was published in BYTE magazine? That was a great article! I used to go to the library and read what ever I could find on robots when I was a kid and much of it was in computer magazines. There wasn't too much out there at first, but as the 80s rolled on, much more became available. It's awesome today to see so much interest. I think the author of the Bert articles in Byte magazine is Karl Brown - there seems to be a few Karls writing robotics articles and books - LOL. I've written 3 robotics books for McGraw-Hill and am working on something different for the next book. I wrote the 'Hexatron' robot article in the premiere issue of Servo. Karl Williams wrote: I think the author of the Bert articles in Byte magazine is Karl Brown - there seems to be a few Karls writing robotics articles and books - LOL. Oops. Karl is a popular name in robotic circles it does seem! I do remember and enjoyed the Hexatron article. Keep up the great writing. I think my favorite TAB robot book was BUILD YOUR OWN WORKING ROBOT by David Heiserman. It was all done with logic chips. Robot builders have come very far and yet there is still so much more to reach for! I read David Heiserman's books when I was younger and they are still on my shelves for reference. He was one of the unsung heros for robot builders. Hi, I am new here and I plan on building the mighty Unicorn-1 but would like to know if anyone has had any trouble with getting the 16 LED flasher to work, I cant figure what I did wrong.